Banana oatmeal cookies are the kind of cookies you can eat for breakfast without feeling the least bit guilty since they are full of good-for-you breakfast ingredients like oatmeal, bananas and walnuts. They're a perfect way to use up overripe bananas tool. If you like banana bread you will love these Oatmeal Banana Cookies. For best flavor, be sure to use really ripe bananas in all your baking. Your cookies, breads and muffins will turn out sweeter, moister, and more flavorful. For best results bake your banana cookies one baking sheet at a time in the center of your oven. And remember to let your cookie sheets cool completely before dropping cookie dough on them to prevent your Oatmeal Banana Cookies from melting before they have a chance to bake. This banana cookie dough needs to chill at least 10 minutes and up to 6 hours to let the dough firm up before baking. 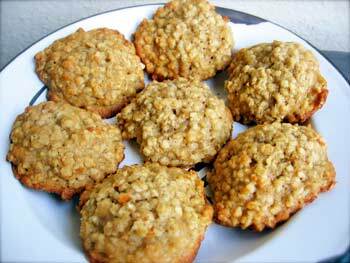 The recipe specifies old-fashioned oats, which will produce the chewiest banana oatmeal cookie. You can substitute quick-cooking oats, but your cookies will be less chewy. Just be sure not to use quick cooking oats! In a medium size bowl whisk the flour, baking soda, salt, and nutmeg until well blended and set aside. Beat in the mashed bananas, egg, and vanilla, stopping to scrape down the sides of the bowl with a rubber spatula if necessary to make sure everything is well blended. Stir in the oats and nuts (if using) just until combined. When you are ready to bake the cookies, preheat your oven to 350F degrees. For best results line cookies with silicone liners, or parchment paper. Alternatively, use ungreased cookie sheets. Drop cookie dough by rounded tablespoonfuls onto prepared cookie sheets about 3 inches apart. 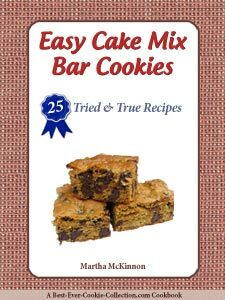 Bake the cookies until their edges are golden brown, but they are still soft on top, about 15 to 17 minutes. Remove from the oven and let the cookies rest on cookie sheets for several minutes, then transfer them to a wire rack with a spatula and allow them to cool completely before storing. This recipe yields about 3 dozen Oatmeal Banana Cookies. Beat in the egg, then puréed bananas and vanilla. 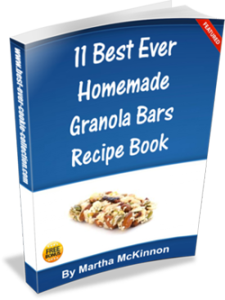 In a medium bowl, combine the oats, flour cinnamon, baking soda and salt. Stir dry oat mixture into banana mixture just until blended. Drop dough by rounded tablespoonfuls about 2 inches apart onto cookie sheets sprayed with nonstick cooking spray. Flatten tops of cookies with back of spoon. Insert a wooden popsicle stick into each cookie to resemble a lollipop. 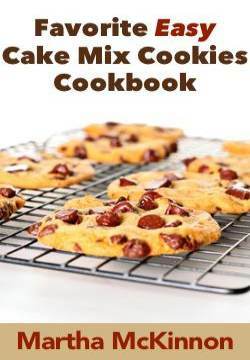 Bake the cookies for 12 to 15 minutes or until lightly browned. Remove from the oven and let the cookies rest on cookie sheets for several minutes, then transfer to a wire rack and cool completely. 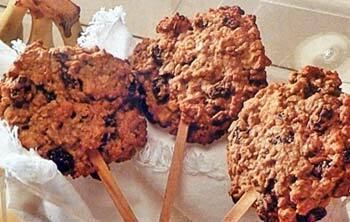 This recipe yields about 24 Oatmeal Banana Cookie Pops.